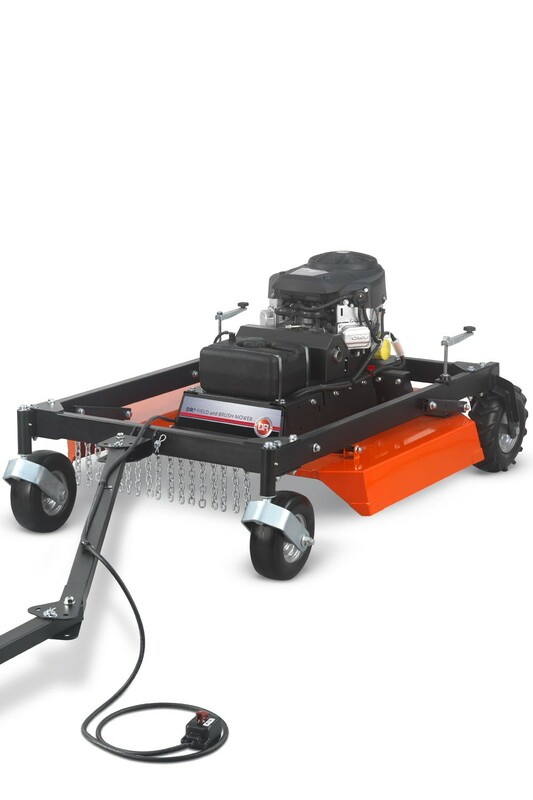 Quickly clear large areas of brush and weeds with this powerful tow behind field & brush mower. The powerful new DR tow behind field and brush mower has a number of new features including a new floating deck design for increased performance. 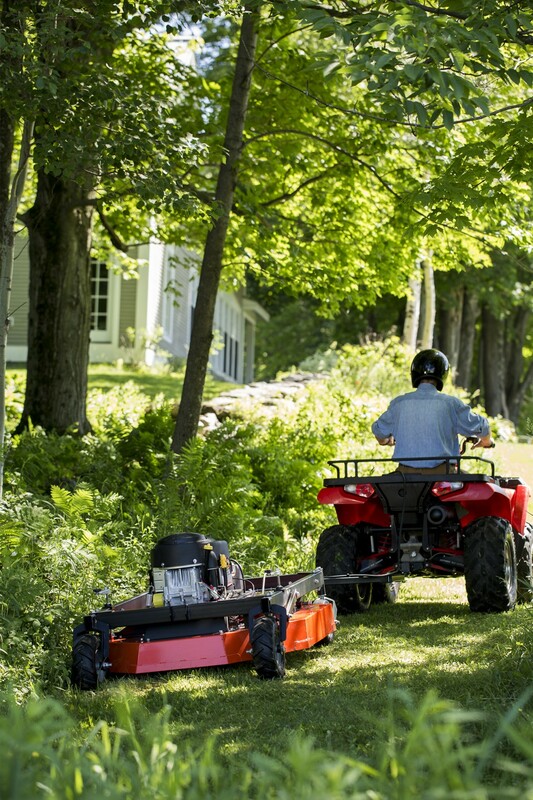 Powered by a Briggs & Stratton V-Twin electric start engine, the tow behind mower will cut through thick grass, weeds and even saplings up to 3" thick. 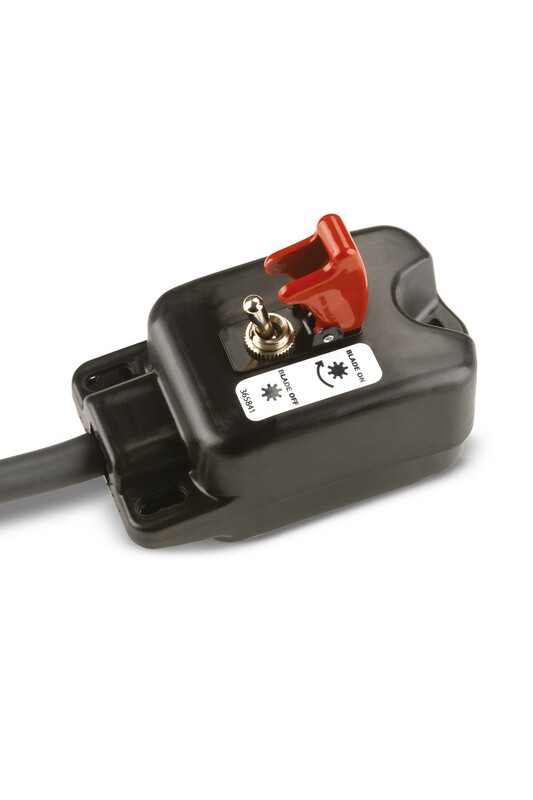 The control panel allows the user to engage and disengage the blade from the towing vehicle. Large 44" Wide Cutting Width. 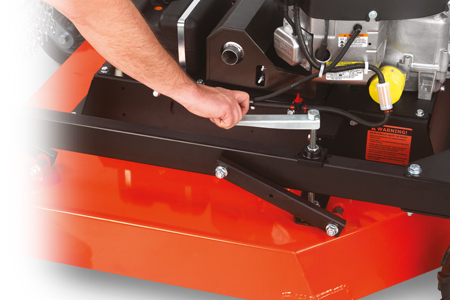 The 44" wide cutting deck ensures swift progress when cutting through weeds, brush, grass or even 3" thick saplings. 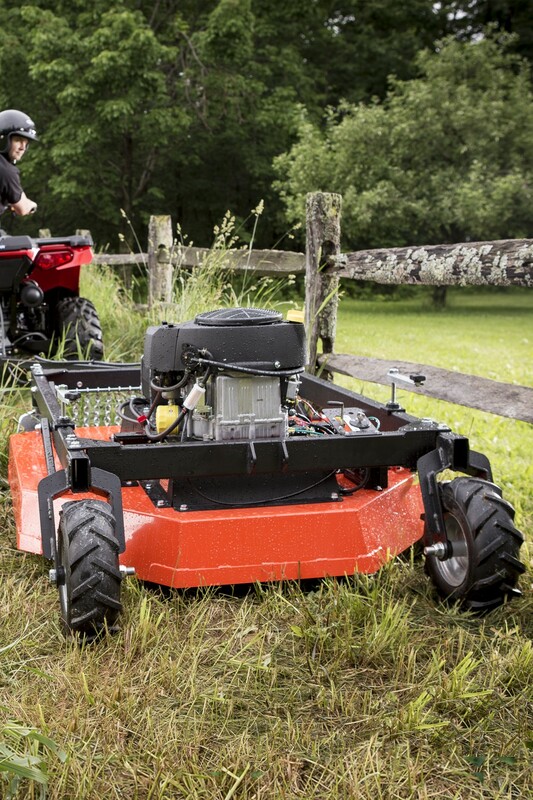 This tow behind field and brush mower is capable of mowing up to 2 acres per hour. Choose your mowing height between 4" to 7.5" with two easy-turning hand cranks. 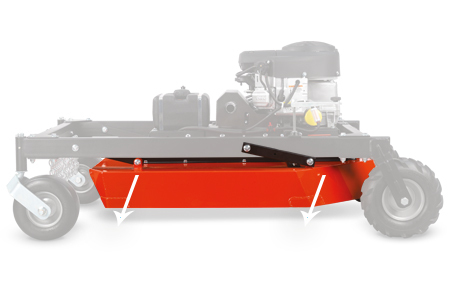 The new 44" mower deck on the PRO XL 44 is suspended from the frame, allowing it to ride over uneven ground, minimising scalping and protecting the drivetrain from damage. Tow using the tow ball on your ATV. 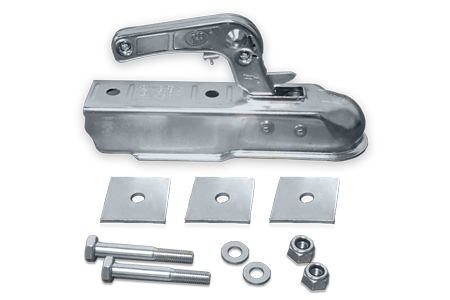 The optional 50mm Tow Hitch Kit can be purchased enabling the DR PRO XL-44 Tow Behind Field & Brush Mower to be towed using an existing tow ball on your ATV. What happens if I accidently hit a hidden rock or tree stump with the tow behind Field & Brush Mower blade? The unique swinging blades will pivot when an immoveable object is hit. This will protect the spindle and engine from damage. What size ATV is need to tow the DR PRO-XL 44 tow behind field and brush mower? An ATV with a 250cc engine weighing at least 181kg will be able to mow on slopes up to 5 degrees. An ATV with a 300cc engine weighting at least 225kg will be able to mow on slopes up to 20 degrees. How far does the remote-control cable extend beyond the hitch? There is 1.5m (5ft) of cable beyond the tow hitch. Can I use the PRO XL-44 tow behind field and brush mower using my ATV which has a tow ball hitch rather than a pin style hitch? Yes, there is an optional 50mm Tow Hitch Kit which enables the PRO XL-44 to be towed using a tow ball. As modifications are required to the standard tow bar, it is advised that the kit is fitted by a DR service dealer. 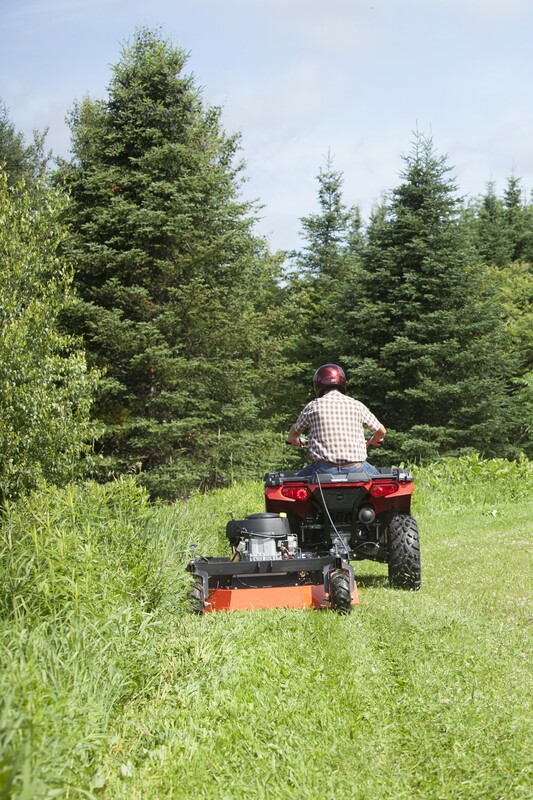 Can the tow behind mower be used to mow on slopes? The PRO XL-44 is fitted with a full pressure oil pump making it suitable for mowing on slopes up to 20 degrees as long as the towing vehicle weighs a minimum of 225kg and has a 300cc engine. 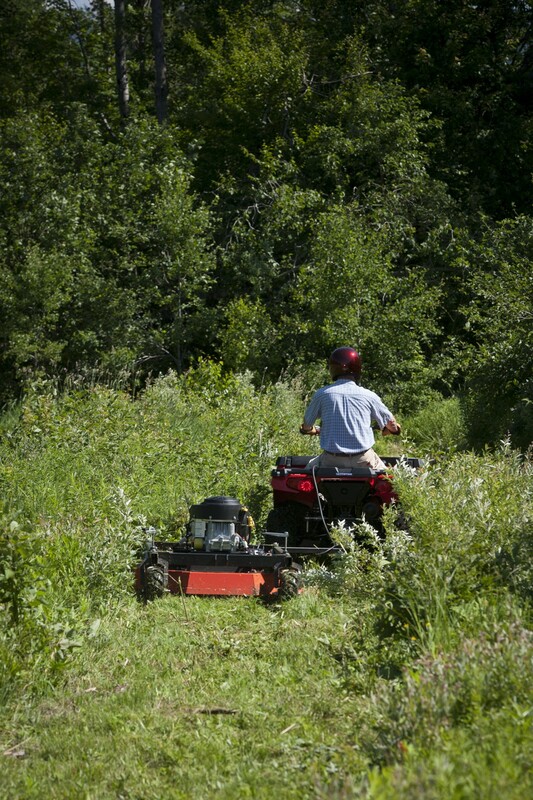 We do not recommend mowing on slopes greater than 20 degrees. How will the tow behind mower perform if the grass is wet? 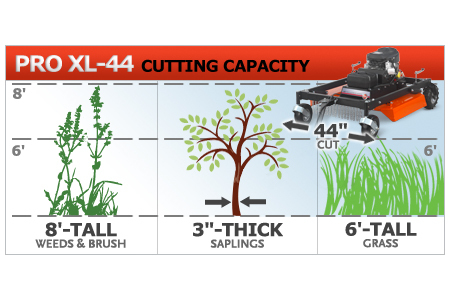 The power of the PRO XL-44 can handle mowing in wet conditions however tall grass and weeds cut better in the dry as they tend to fall over easier making it difficult to achieve a clean cut.